"Grand Theft Auto: Mission Pack #1 - London, 1969 is a mission pack for Grand Theft Auto, and the second game in the series. London, 1969 was released on 31 March 1999 for DOS, Microsoft Windows. In April 1999, a version for Sony's PlayStation was released. The game uses the same game engine as Grand Theft Auto, thus giving the game graphics and gameplay similar to Grand Theft Auto. Like Grand Theft Auto, the mission pack is divided into sub-sections with short cut scenes between. London, 1969 was the first expansion pack released for PlayStation. The player names their character (Default is 'Sid Vacant', a parody of Sid Vicious) and chooses a picture to represent them. The picture is only seen upon completion/failure of a mission and doesn't affect the appearance or personality in any way. The player must work for 'The Crisp Twins', another parody, this time of 'The Kray Twins'. 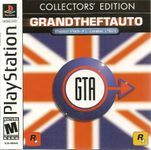 The expansion introduces 30 new vehicles, 32 new missions, and instead of fictional locations based on real-life cities, as in Grand Theft Auto (Liberty City, San Andreas and Vice City), the game takes place in London in 1969. The player again plays the role of a criminal involved in organized crime. The temporal setting has been exploited through cultural and historical references, including the appearance of a James Bond-like character and use of stereotypical Cockney slang. In-game dialogue includes such lines as "Oi!, stop right there! ", "You're nicked!" (under arrest) and "You're brown bread!" (i.e. You're dead). Similar to the bonuses in Grand Theft Auto and Grand Theft Auto 2, the player receives a large cash reward for running over a group of Mods with a car without braking. Successfully performing the trick displays the message "KEEP LONDON TIDY!" and awards a cash bonus." Source: Wikipedia, "Grand_Theft_Auto_London," available under the CC-BY-SA License.